Chancellor James Anderson announced today the appointment of Dr. Pam Jackson as Provost and Vice Chancellor for Academic Affairs at Fayetteville State University (FSU). Jackson, who has been serving in an interim capacity, was selected for the post after a nationwide search. "I could not be more pleased to welcome Dr. Pam Jackson as a permanent member of my senior administrative team," Anderson said. "We had several highly qualified candidates apply for the position and after extensive interviews with the faculty, staff and students, it was clear to the selection committee that the most qualified candidate was Dr. Jackson. In her time as Dean of the Broadwell College of Business and Economics and as interim provost, she demonstrated her talents as both a scholar and an administrator, and she will serve Fayetteville State University well." In her role as Provost and Vice Chancellor for Academic Affairs, Jackson will be responsible for the overall effective operation of the Division of Academic Affairs at FSU. She will provide intellectual leadership for academic programs and student learning, for research and scholarship, and for university outreach. Jackson will also manage the university's four academic colleges - College of Arts and Sciences, Broadwell College of Business and Economics, the College of Education, and the University College. A part of the FSU family for nearly 13 years, Jackson began her career as Assistant Dean for Assessment and Retention in the Broadwell College of Business and Economics from 2006-2007. From 2007-2015, she served as Associate/Assistant Dean and Pre-Business Director of the College of Business and Economics. 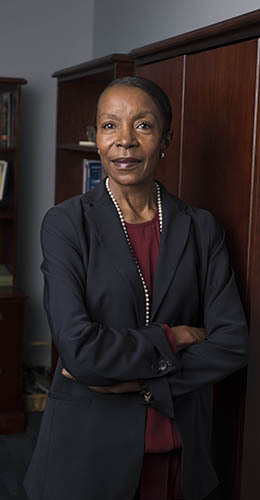 She served as Dean of the College from August 2015 to December 2017, before becoming Interim Provost and Vice Chancellor for Academic Affairs. Before coming to FSU, she served as chair of the Department of Banking and Finance at Fayetteville Technical Community College for five years. A native of Detroit, Michigan, Jackson earned a Bachelor of Arts Degree in Psychology from Albion College. She also holds Master of Public Administration and Master of Business Administration degrees from Troy State University and FSU, respectively. Jackson earned her doctorate in information technology/information systems from the University of North Carolina at Charlotte.